Big Buddha takes the path less traveled, making its Houston feel rebellious not through studs and grommets but by some cleverly placed chains. Chains are nothing new for creating rock and roll edge, but they tend to form the handles, or be laid haphazardly over the design. Big Buddha obscures them a bit, embedding them in the seams so we get just a glimpse of heavy metal. I really like the look, which punches up the messenger-style cross-body with its gentle camel-colored leatherette. Without the chains the Houston would have been very pedestrian, but their addition makes the design something original and contemporary. The Houston's not all about looks though. It's made for business, with a zippered pocket on the back and more leatherette trimmed pouches inside the ample interior. The strap is long and adjustable, and strangely attachable. Big Buddha says this allows us to use the purse as a clutch, although you'll never be able to utilize all its space if you do. Without a handle it'll simply become unwieldy when loaded up. 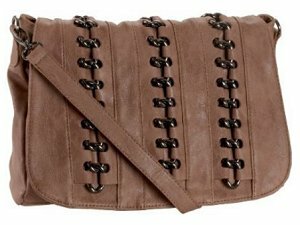 It might not be the perfect evening clutch, but Big Buddha definitely delivers a great day bag here for an affordable $84.95. The Big Buddha Carrie bag, a great alternative to this chain accented bag.